Today, enferno changes its name to Storm Commerce and introduces a new visual identity. The decision to implement the name change was taken at the Annual General Meeting and marks a new stage in the development of the company. 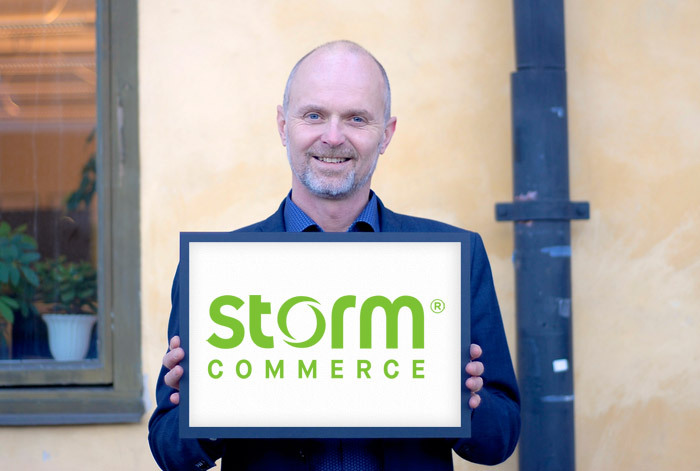 Stefan Sånnell, CEO of Storm Commerce, talks about the name change and new identity. Why the name change now? We have great ambitions and want to grow, both in Scandinavia and Europe. To succeed, a strong and clear brand is a must. By changing name, we’re marking a new phase in the evolution of the company. The reason for changing the name to Storm Commerce is that the Storm product name is, and has been, much stronger than our original company name from the outset. Therefore, we wanted to take advantage of our already well-established name in the industry. Why add the Commerce suffix? The decision to adopt the name Storm Commerce was a natural one. The “Commerce” suffix is commonplace in eCommerce platforms and clarifies our offering to customers and partners in a better way. It also makes our profile more viable on the international stage. Before implementing the name change, you also produced a new logo and visual identity. Tell us more! Tomas Isby, one of the founders of the company, was given the prestigious task of creating a new logo. Johan Wallberg of digital agency Iveo gave it the final polish. He also helped us develop a new graphic profile, which will modernise the visual impact of the company and enable us to better communicate what Storm stands for. We partially rolled out the new layout in conjunction with the launch of our new website in November. We’re now in the process of migrating the website to our new domain storm.io. The new visual identity is the beginning of a new phase. What message do you want to convey? We’re proud of our long experience and broad expertise in eCommerce. The Storm platform was launched in 2008 and is now one of the most complete solutions for scalable eCommerce in Scandinavia. Our new visual identity reflects how we want to be perceived in the future – as an innovative, long-term, knowledge-orientated technology company that is a driver of the development of CMS-independent eCommerce platforms. We want to continue to attract customers who are experiencing strong sales growth online and want to be at the vanguard of their industry. You will gradually be seeing and hearing more of us. We want to turn up the volume and show what we are doing together with our customers and partners, as well about our product development activities. We want to sharpen our offering. Our new identity will help us achieve that and give us a greater opportunity for recognition.